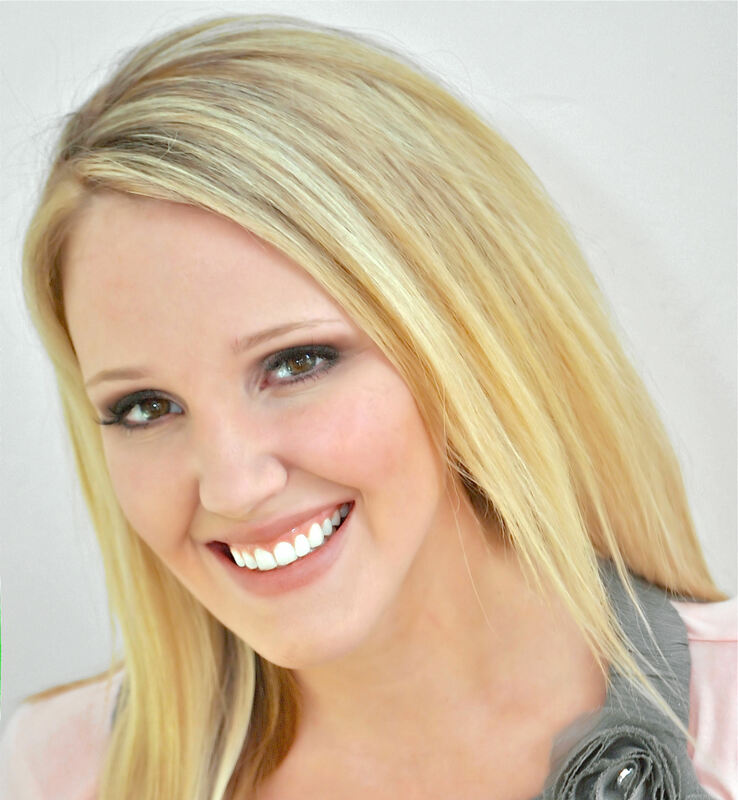 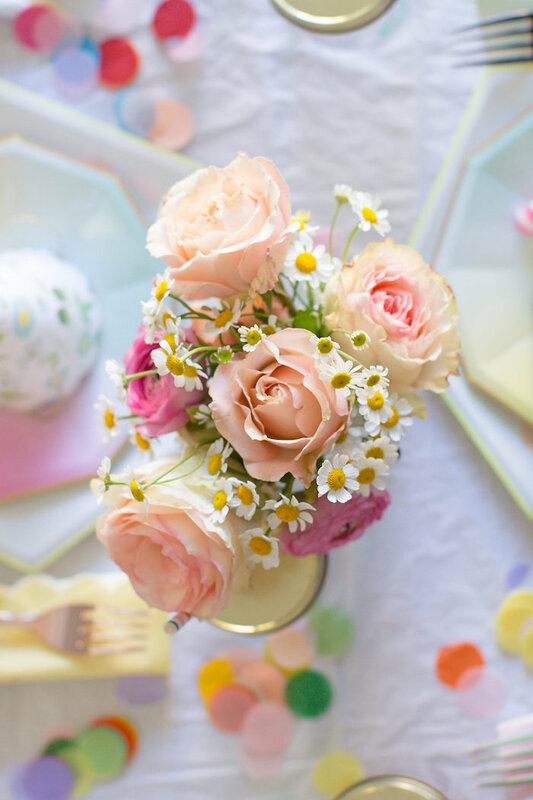 by Roxanne McClure of Roxanne McClure Photography, out of Belmont, CA, USA, will make your day! 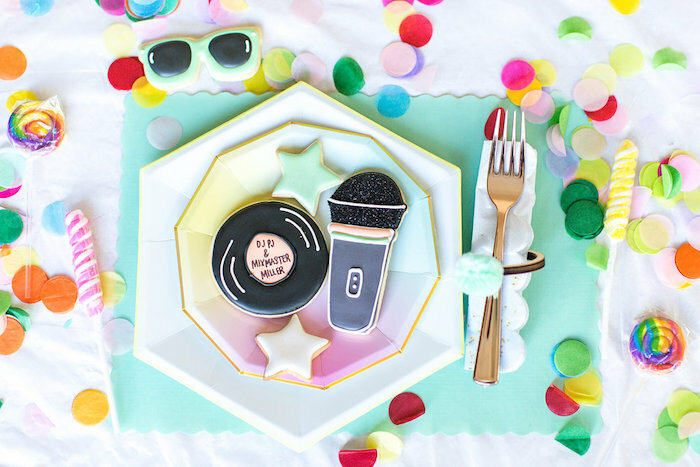 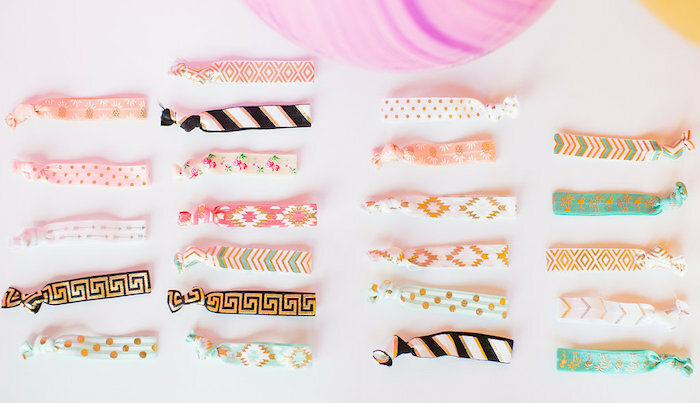 Styled with details rockin’ and right, this birthday bash is truly a sight! 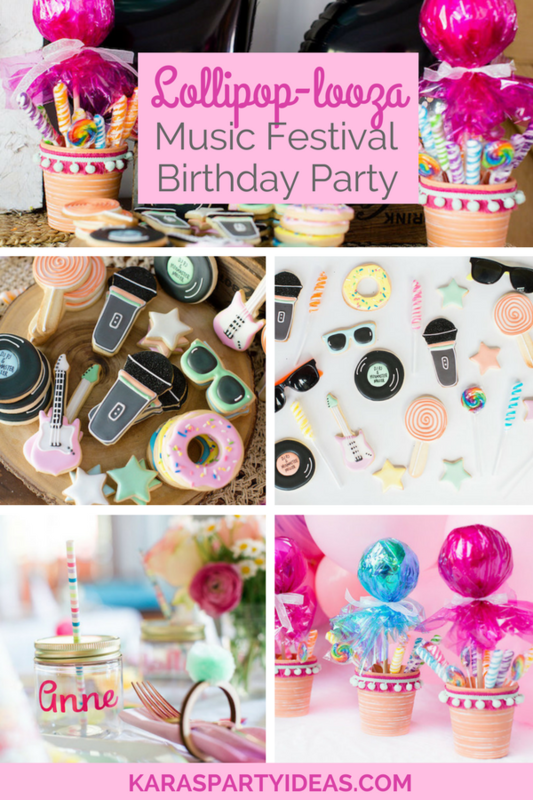 “When your kids basically share a birthday and they both have a love for music, it is only fitting to throw a double birthday bash with a music festival theme. 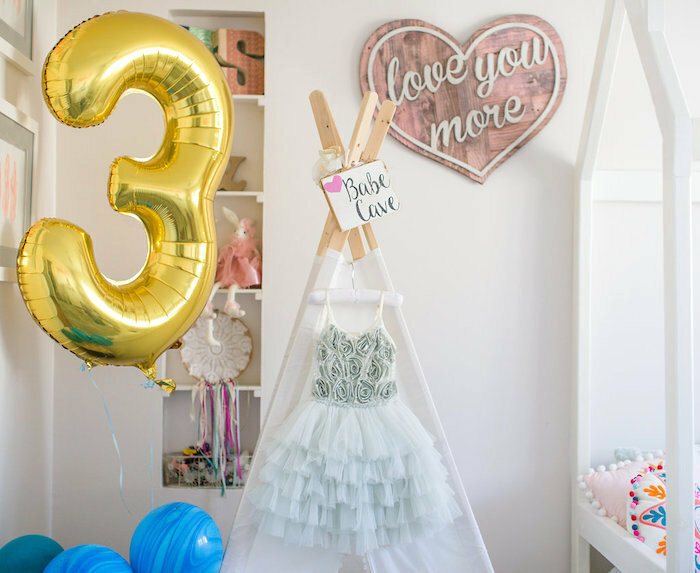 My husband and I have always loved festivals, although life changed a bit three years ago with our first child. 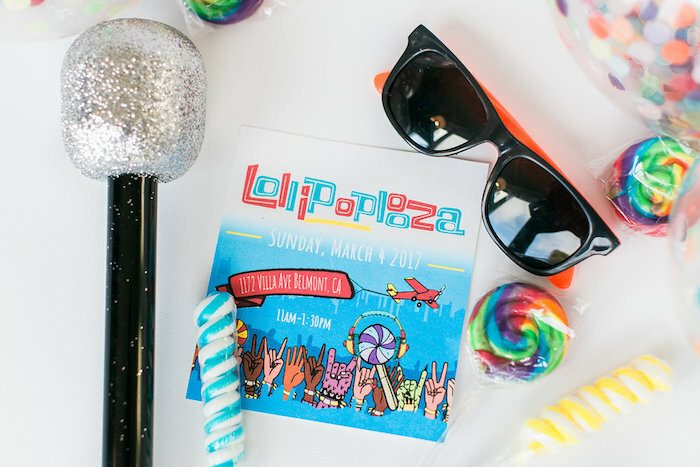 Our festival days were put on hold for diaper duty and indoor toddler dance parties. 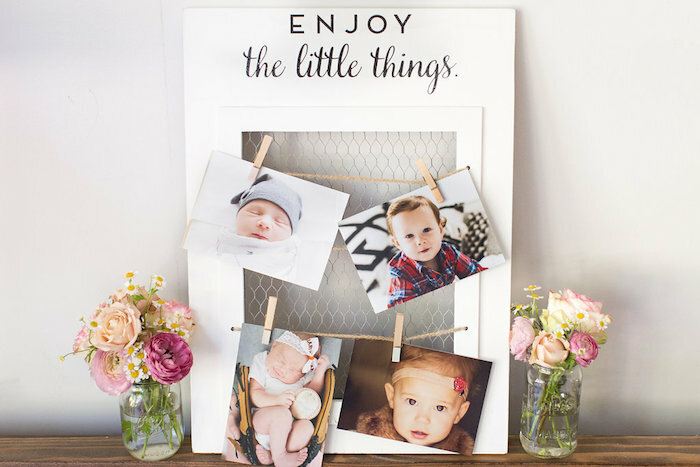 Luckily our two little loves gave us a reason to bring the festival vibe into our home. 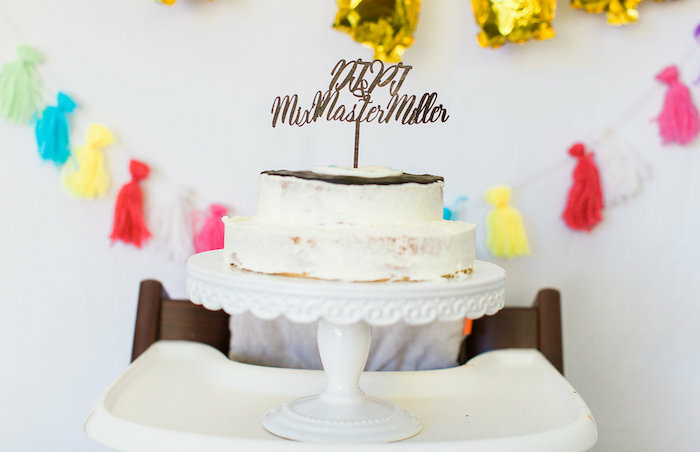 Our little man Miller was approaching this 1st birthday and our daughter Penelope was about to turn 3. 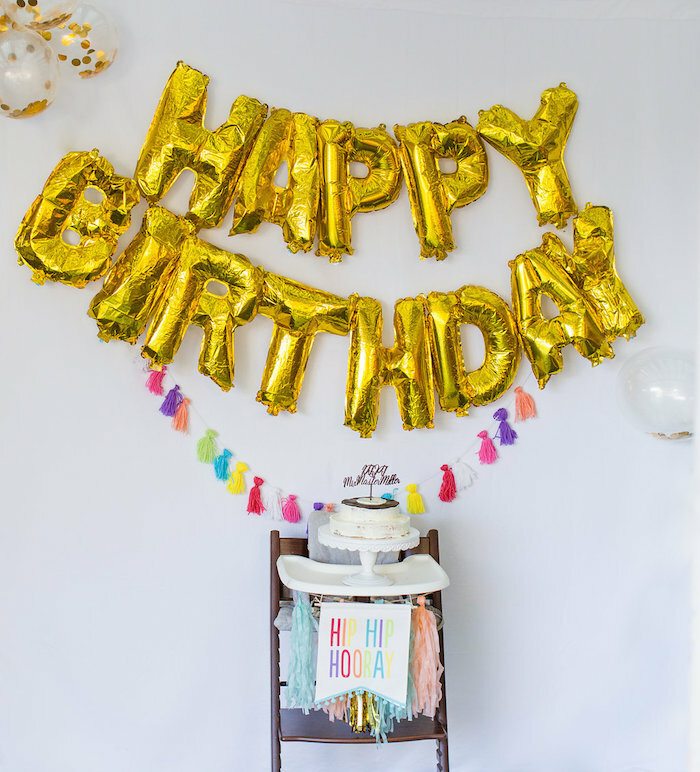 As a mom, photographer and DIY enthusiast who spends lots of time admiring different types of celebrations, planning a party always sounds like a treat. 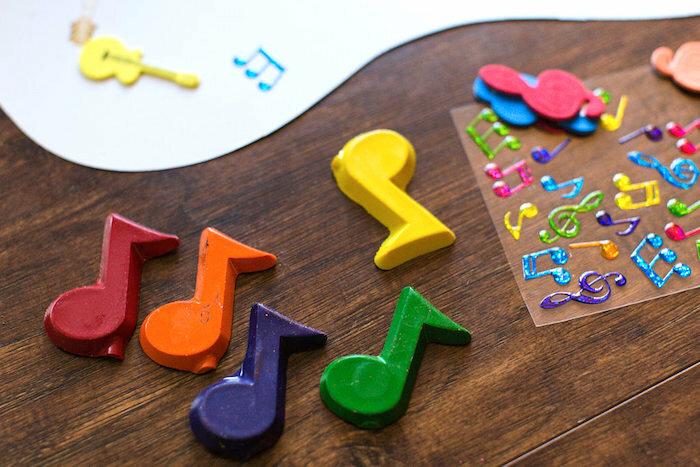 With kids and time constraints, this process has to start months in advance. 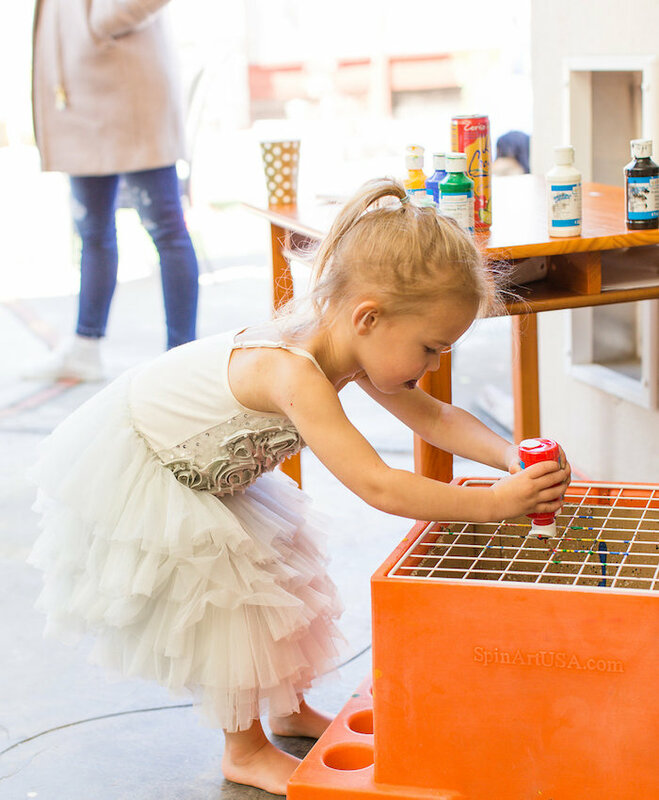 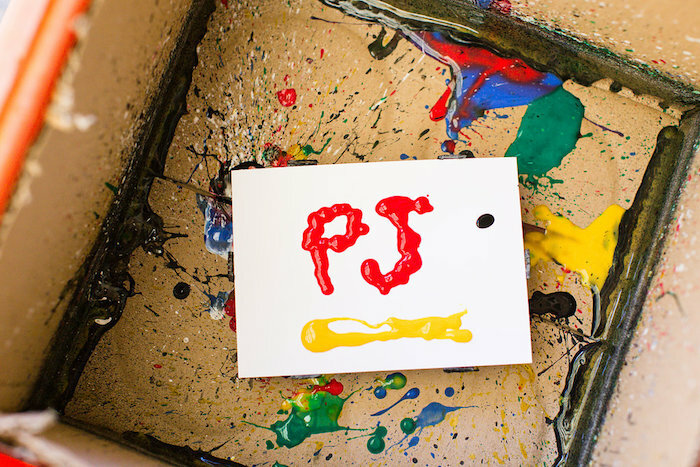 This year came with new inspiration and a party for 38 kids; it didnt disappoint. 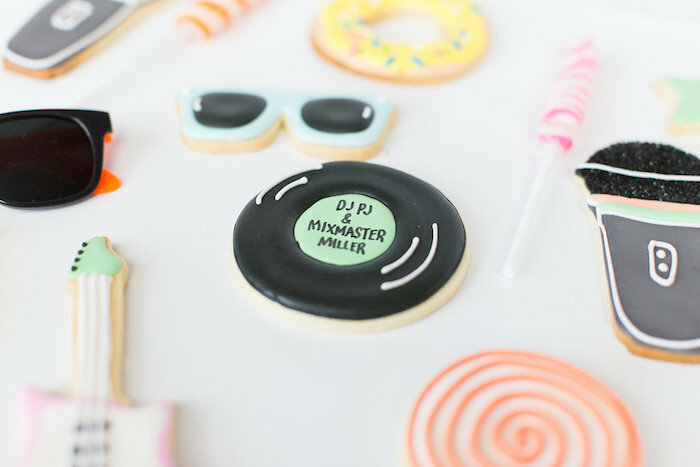 DJ PJ and Mixmaster Miller invite you to take a place at their Lollipop-looza bash. 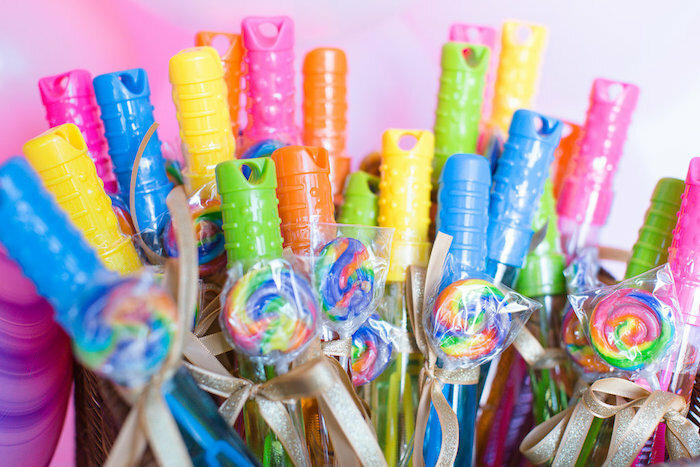 My inspiration started with a bright color pallet of lollipops and confetti from Oh Happy Day. 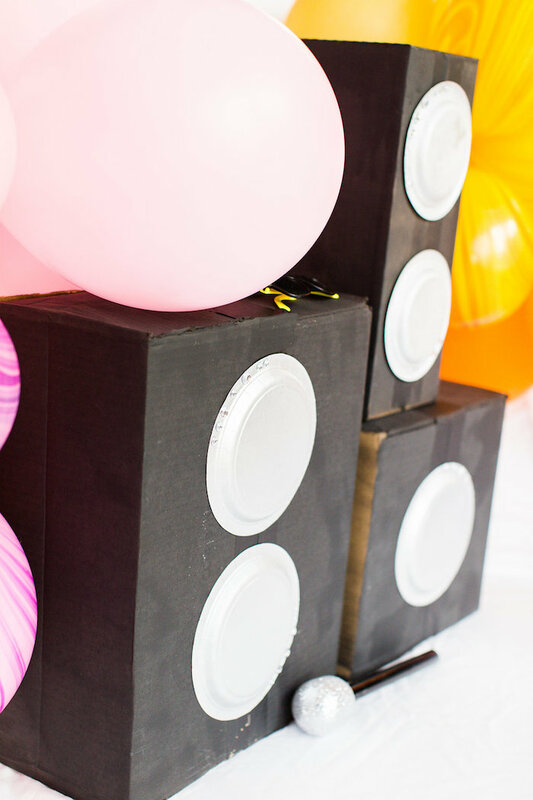 From there I made colorful balloon garlands and speakers out of boxes (from our Amazon deliveries) and paper plates. 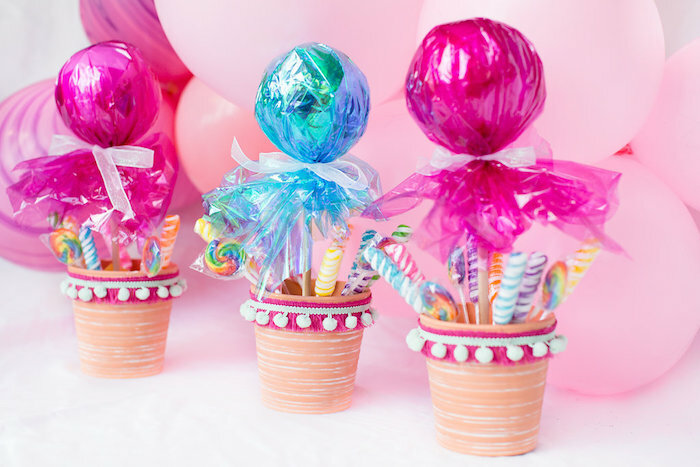 Lollipops were made from dowels and styrofoam balls that were wrapped in cellophane, and then placed in terra-cotta pots which I decorated by hand. 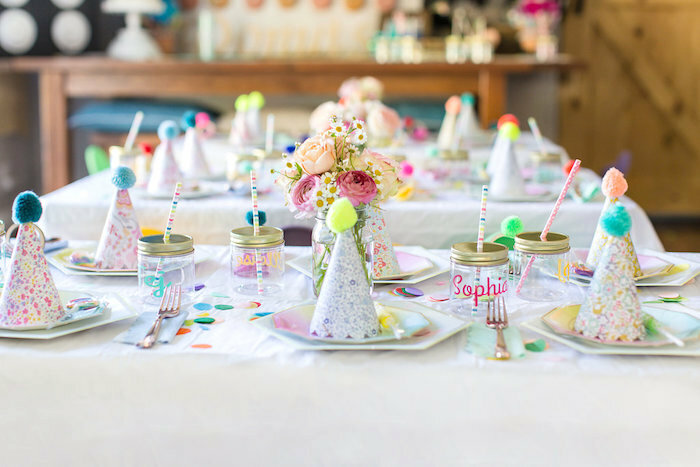 Tables for the little kids were full of color with a dash of confetti, and pom poms were strewn across them. 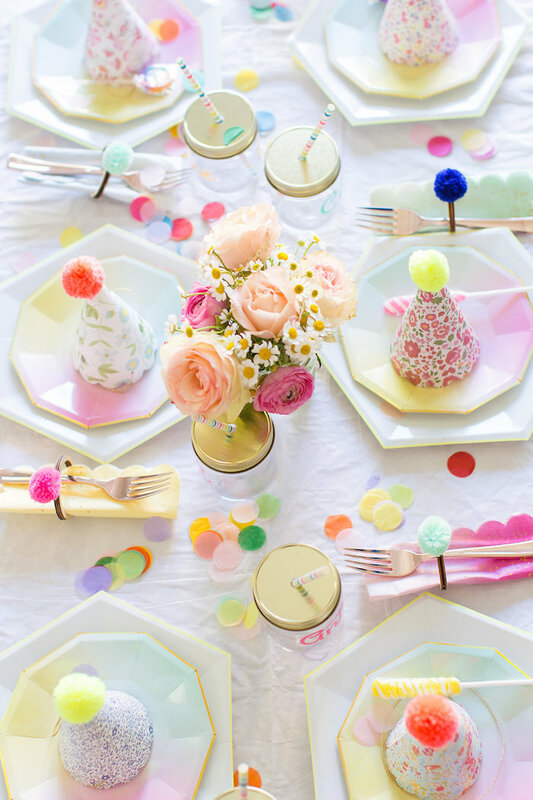 Large geometric mint plates were topped with ombre color wheel plates to create energetic place settings. 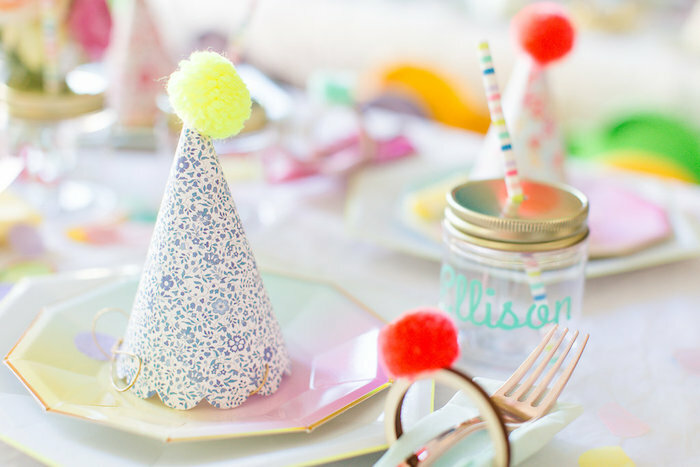 Party hats were a must, so each little one got a unique patterned hat topped with a pom pom. 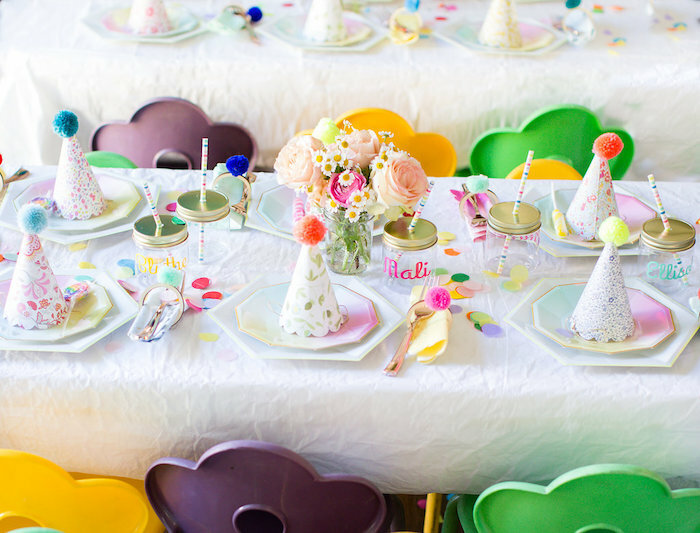 One of my favorite table accents were our napkin holders from Meri Meri party. 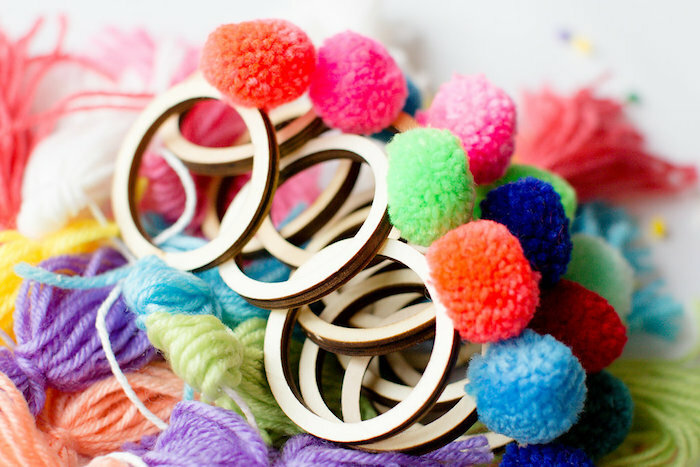 They were wooden circles topped with colorful pom poms. 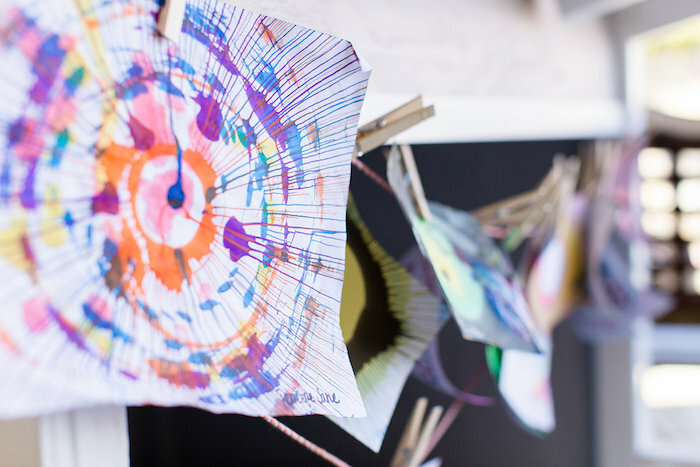 They were functional but also fun; many of the kids used them as bracelets throughout the afternoon. 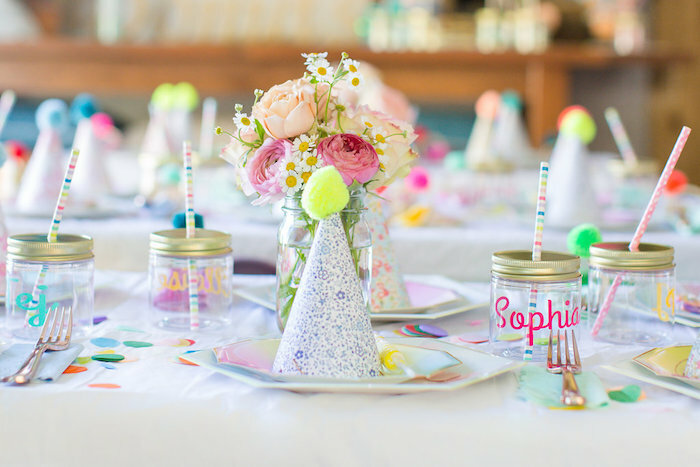 Each table had a few bouquets of wildflowers, garden roses and ranunculus that were placed in mason jars from our wedding. 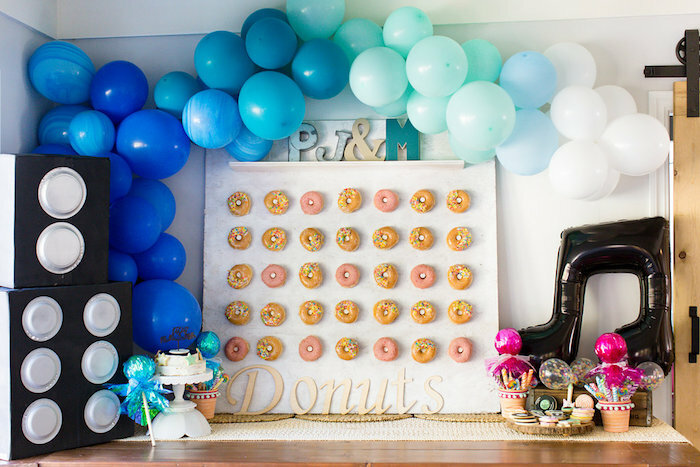 They were the perfect accent to soften the setting while keeping it playful. 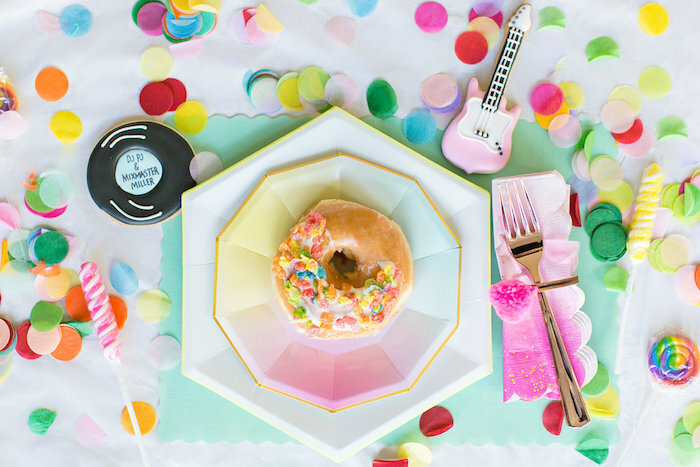 For the food we wanted to be kid-friendly but authentic to the theme. 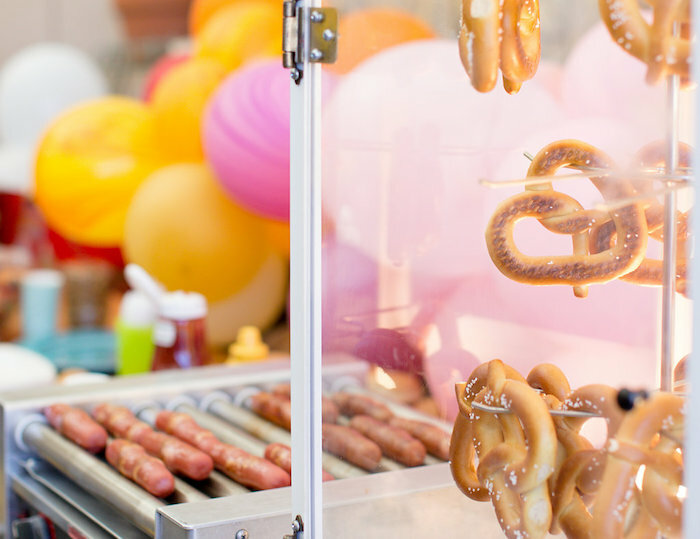 Festival bites consisted of soft pretzels, hot dogs, seasonal fruit sticks and mini mac and cheese cups. 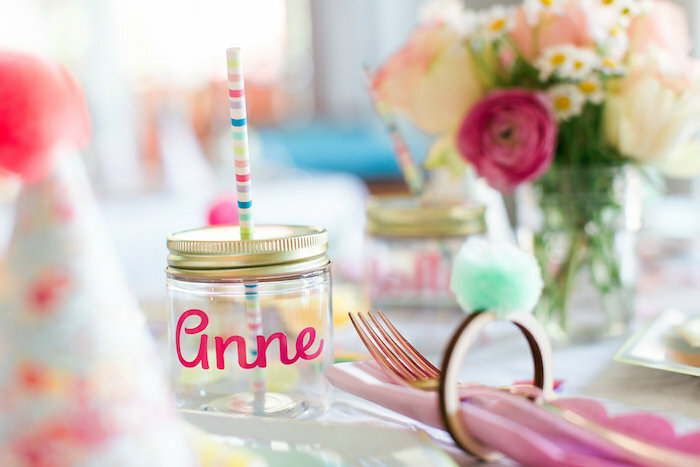 The kids were able to quench their thirst with personalized mini mason jars filled with water or Honest fruit juice. 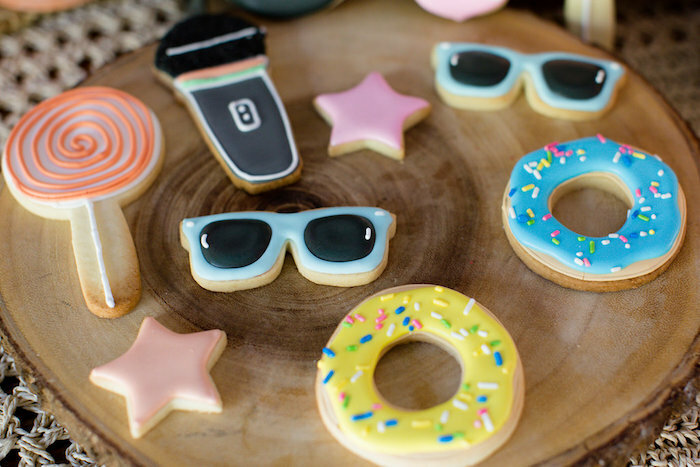 My entire family has a sweet tooth so i knew I needed an assortment of desserts. 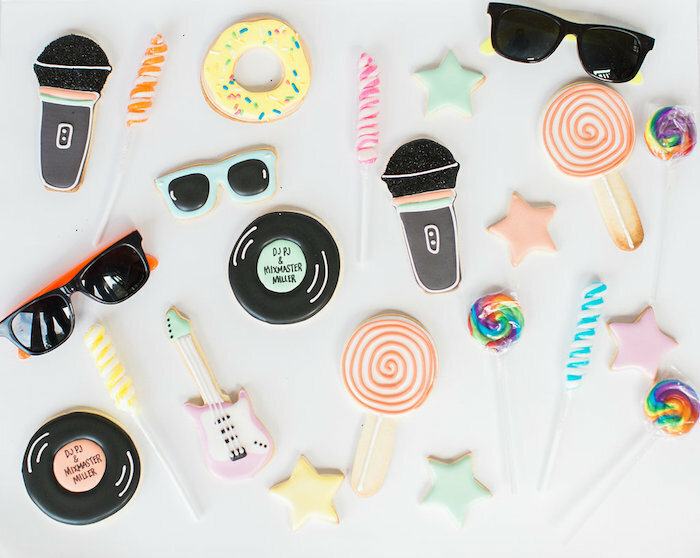 Sugar cookies in the shapes of records, guitars, stars, sunglasses and lollipops by XO Bakes were created to fit the theme. 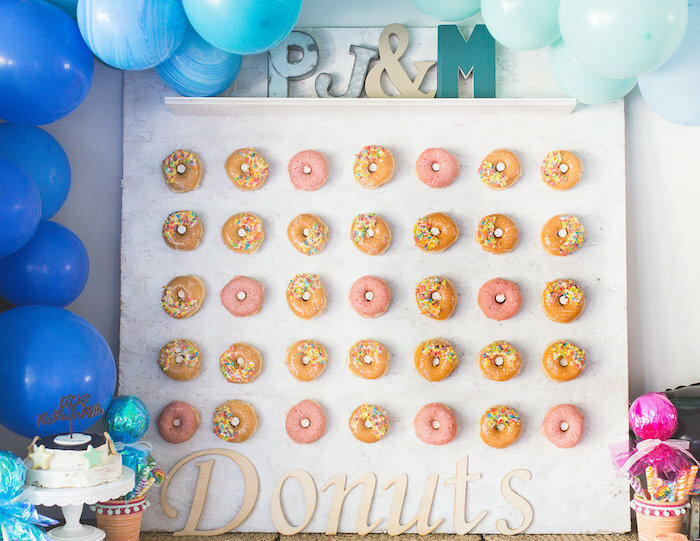 I made a donut wall out of wood and dowels and decorated it with donuts. 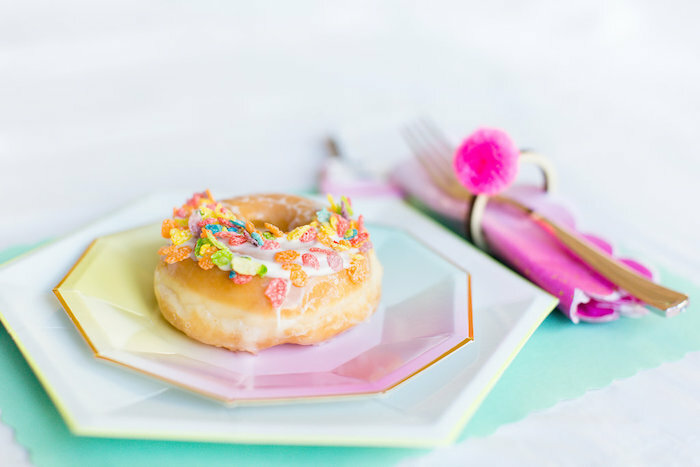 I took basic donuts and dipped them in white chocolate and fruity pebbles to give them a colorful pop. 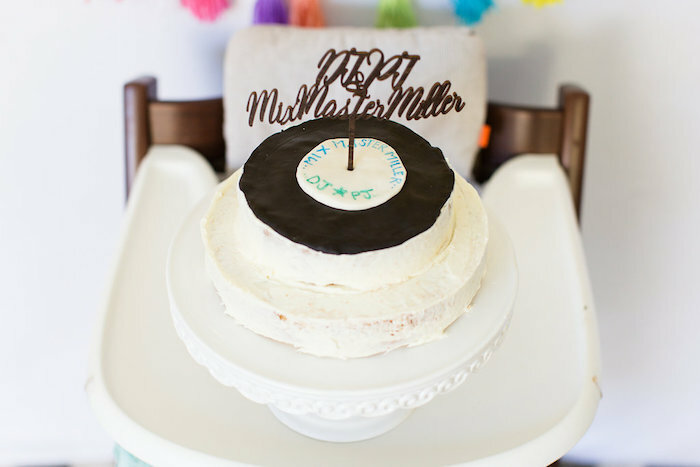 We needed a first birthday smash cake for Miller, so I made a vanilla cake with a butter cream frosting and topped it with a home-made fondant record to fit the theme. 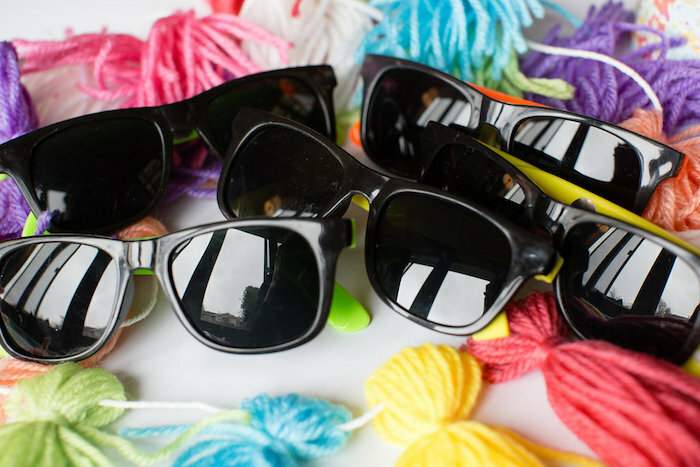 All good festivals include swag, so the kids got sunglasses and VIP wrist bands from Baileys Blossoms upon entering the festival. 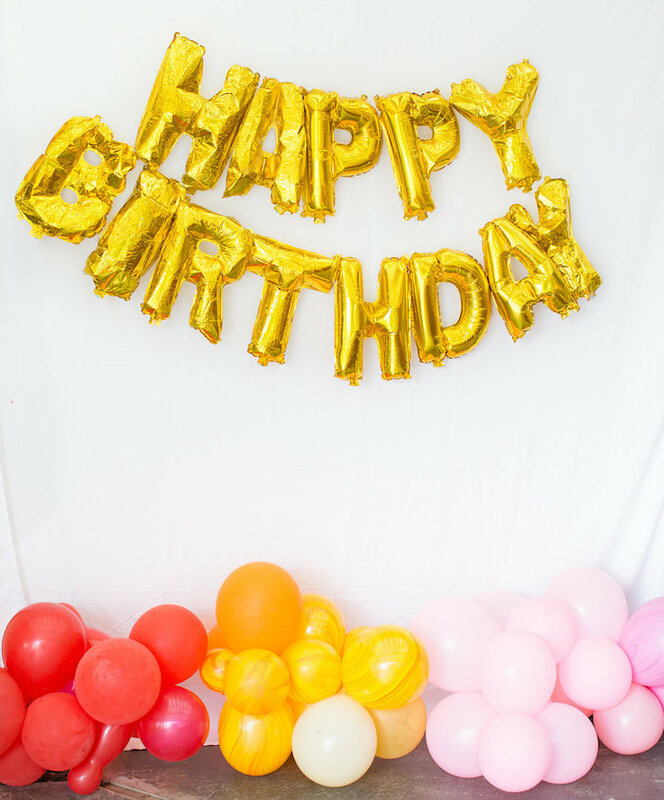 Activities such as spin art, face painting, balloon animal making, guitar making and bouncy house fun were available all afternoon. 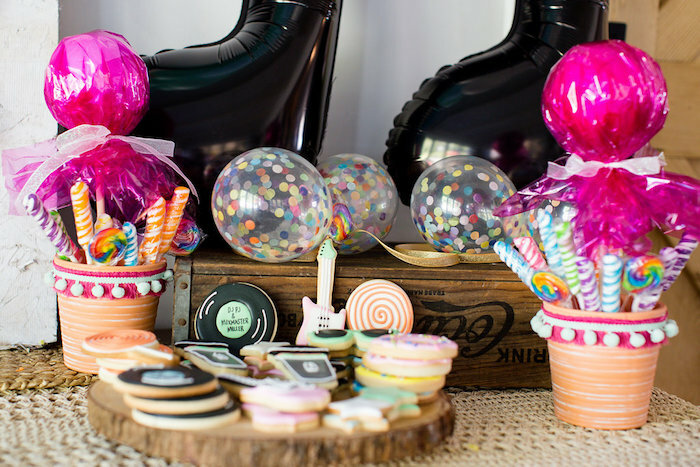 This gave kids plenty of entertainment which also allowed parents to sit down with a glass of Sauvignon Blanc, sparkling water or beer. 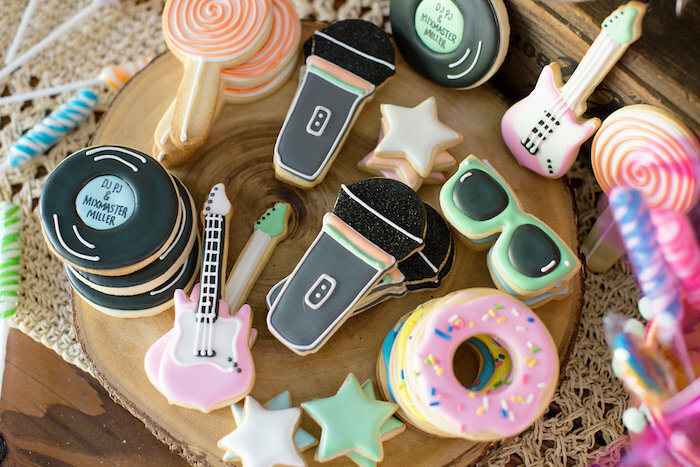 Rock on with these party ideas!